Trekking through the wilderness with your pack and your tent, you can laugh in the face of the elements–because you're wearing a jacket that's made for the job. Mens The Humboldt Jacket is the jacket that does it all. 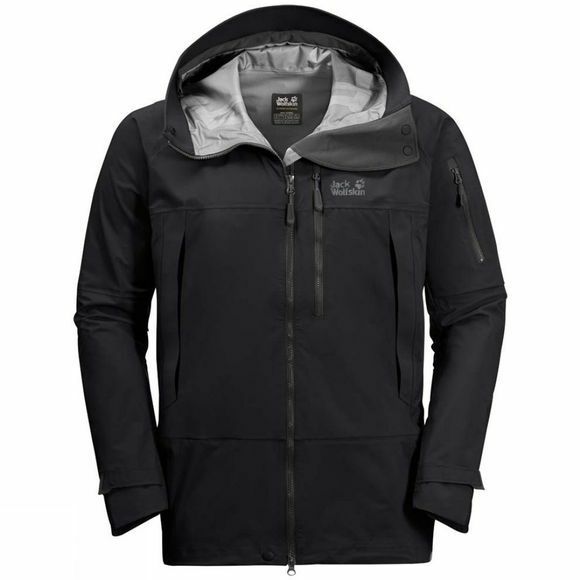 This high performance trekking jacket delivers the ultimate in weather protection. This is our flagship trekking jacket, designed for weeks on the trail with a heavy pack. It is stretchy and extremely hard wearing yet still relatively light–because it is tailored from one of our very best shell fabrics: Texapore O2+ Hyproof. This jacket keeps you warm and dry in all weathers. When you're battered by wind and rain from all sides, simply pull up the tunnel hood and you're sorted. The hood has an extended peak for extra face protection. Adjusting the hood is fast and simple. There are draw cords on the back, on the top and either side of the chin that are easy to locate and use. Mens The Humboldt Jacket has a high collar that shuts out the cold wind and has a very clever design. It comes right up over the mouth and is equipped with breathing holes. And it has two width settings, so you can decide how snug you want it. Mens The Humboldt Jacket is the go-to jacket for big trekking trips–from forests and steppes to high mountain trails. The fabric is very breathable so it provides the consistently excellent wear climate you need to perform at your best when you're out in the wilds. And when you need an extra blast of fresh air, simply open up the pit zips. There are multiple pockets, inside and out, so you can keep your snow goggles, GPS and other little items handy.